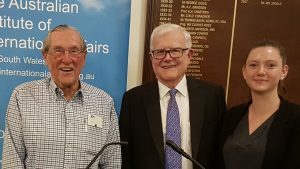 On Tuesday 30 October the Institute welcomed Mr Richard Woolcott AC, former Secretary of the Department of Foreign Affairs and Trade and prominent commentator on international affairs, to speak on the future of Australian foreign policy making and the problem raised by community phobias of Russia and China. Mr Woolcott remarked that today there are a large number of inexperienced people working in the offices of Ministers and the Prime Minister, which crowds out intelligent and analytical foreign policy advice. This is most problematic when faced with a changing landscape of international relations and the challenge of weighing our security relationship with the US against friendly relations with other major powers. Mr Woolcott emphasised the need for Australia to have a more balanced approach to both Russia and China. Although Putin is ruthlessly determined to reassert Russia as a world power, including in the Asia-Pacific, it is not productive for Australian politicians to contest Russia’s role elsewhere, for example to comment on Putin’s attendance at the G20. In the case of Syria, both the coalition and the ALP leaderships have stumbled into a complex mess essentially in support of the United States. As in Iraq, this ongoing conflict has become a case of Russia versus the Alliance. It is not in Australia’s genuine national interest to be involved and it is imperative that the leaders of the coalition and the ALP recognise the realities, acknowledge our mistake, and concentrate our foreign, security and trade policies in our own region. Unfounded fear of China is particularly counterproductive to Australia’s long-term national interests. Trump’s unilateralism is not a dramatic disruption to the US alliance, and gives the opportunity for Australia to forge more friendly and economically beneficial relations with China. Drawing on his long and highly-regarded career in Australian foreign policy making, Mr Woolcott suggested that Australia’s national interest would be better served by having our own Head of State. He commented that refugee applicants on Nauru could be resettled in New Zealand without risk to Australia. In response to questions, Mr Woolcott agreed that there should be a parliamentary vote on any decision to go to war. He described the recent Wentworth by-election outcome as a measure of Australians’ discontent with the political elite. He criticised Scott Morrison for signalling a possible move of the Australian embassy in Israel from Tel Aviv to Jerusalem: immediate electoral politics had outweighed foreign policy considerations. These reckless comments have diminished if not extinguished the likelihood of the Australia-Indonesia trade deal. In his opinion, there is no bilateral relationship more important to Australia than that with Indonesia. Asked about the South China Sea, Mr Woolcott suggested that we worry too much: China has never intercepted trade through the area. Although China may think of the area as theirs, such claims to areas of influence are not unlike US actions around the globe. On what role Australia can play in the future of international relations, Mr Woolcott observed that we should not underrate our advantageous position as the 13th largest economy in the world. The current situation with a unilateralist US gives us a timely opportunity to establish a more independent foreign policy grounded in our own national interest.